I was delighted to return home from a visit to my sister’s in Alabama to find ripe cherries and black raspberries in our backyard. Yes, the bluejays beat me to several of the cherries, and I always forget the chore of pitting the fruits, but I gathered enough to try in a new recipe. It’s one I flagged in the recent issue of Southern Living which I fittingly read on the porch of my southern sister’s lake house. While the recipe called for blackberries and peaches, I swapped those fruits for cherries and black raspberries. The bars were a fun alternative to a traditional cobbler recipe. Plus, pre-cutting the bars helped with portion control and made them easily portability. They were so simple to grab and go for a breakfast treat on the way to our son’s baseball game. Click here for the Southern Living recipe. 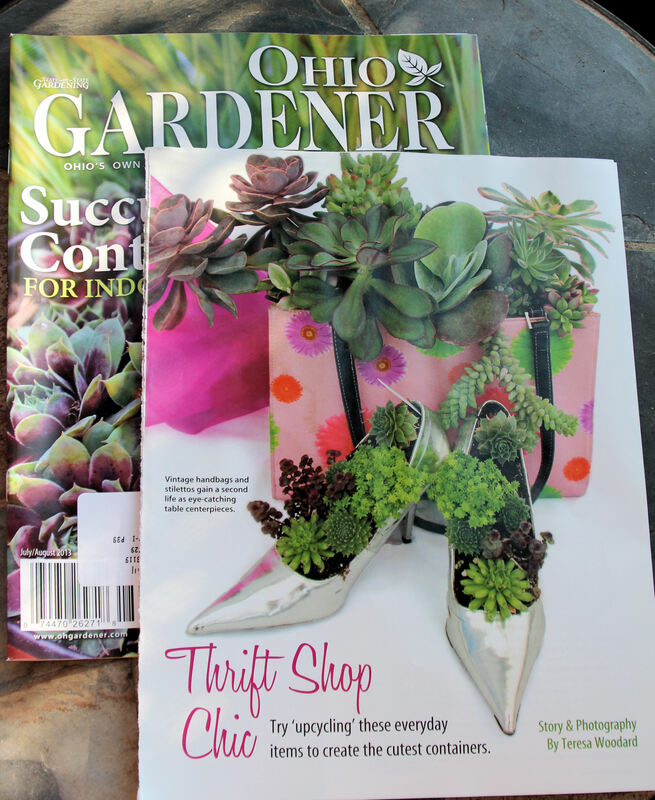 Lou Killilea, owner of DeMoyne’s Greenhouse in Columbus, Ohio, recently shared her clever succulent containers for a story, “Thrift Shop Chic”, in Ohio Gardener, Missouri Gardener, Indiana Gardener, Wisconsin Gardener and Pennsylvania Gardener. She and her daughter Kathy shop thrift stores for second-hand treasures to upcycle as garden containers. Check out the July/August issue to see their stylish succulents in boots, crocs, lipstick cases, handbags and more. Also, see Debra Knapke’s post about favorite succulents. Graduation parties, garden weddings and backyard family reunions – there’s nothing like a milestone event to motivate you to get your garden in peak shape. 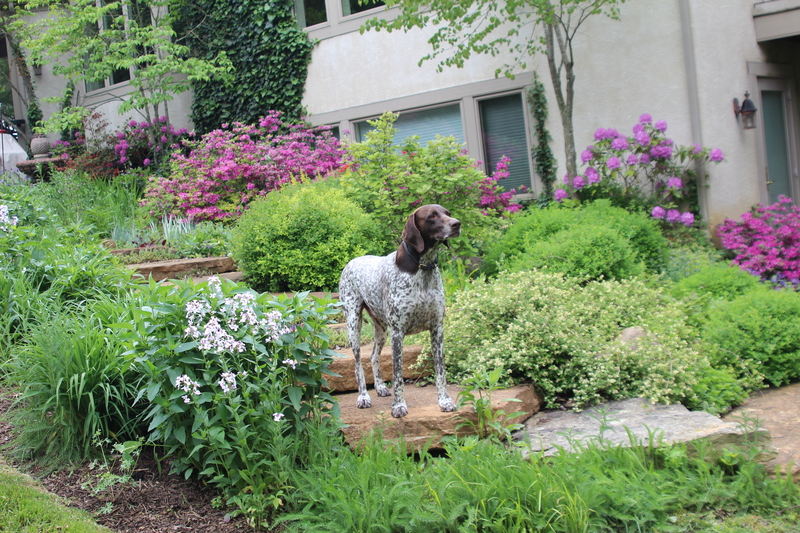 For me, the planning for our daughter’s graduation party started a year ago when I took a closer look at what was blooming in our landscape in late May. 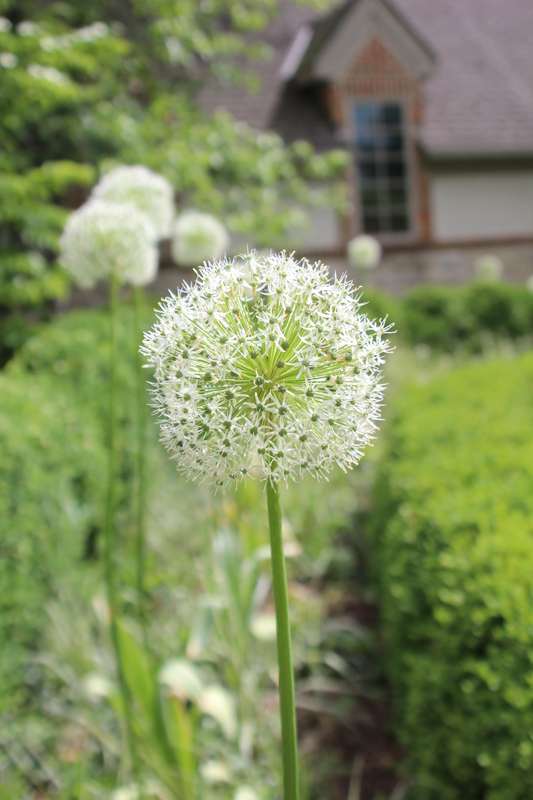 At the time, it seemed rather green and lacking some flowers, so I decided to add some late-blooming allium bulbs to our boxwood hedge and plant some poppy seeds in our meadow. While the allium bulbs bloomed on command, the poppies lagged behind. Still, the impending event deadline pushed us to weed, trim, prune, edge and plant ahead of our typical spring schedule. As the event date drew closer, we checked off more and more gardening chores. Yes, some weeds still snuck by us but we were able to get the garden in good shape to share with friends and family. Now, we’re hoping the early work will give us a chance to rest and enjoy the garden for a few weeks. That is, until we start planning for our second daughter’s graduation in 2014. Start container baskets a month in advance to allow them to fill in better. Sow more seeds for spring-blooming flowers (e.g., poppies and larkspurs) in the meadow. Try planting in October instead of February. Block out days for garden chores, so we don’t get overwhelmed with last-minute work. Welcome friends’ gracious offers to help. Enjoy the successes and accept the imperfections.